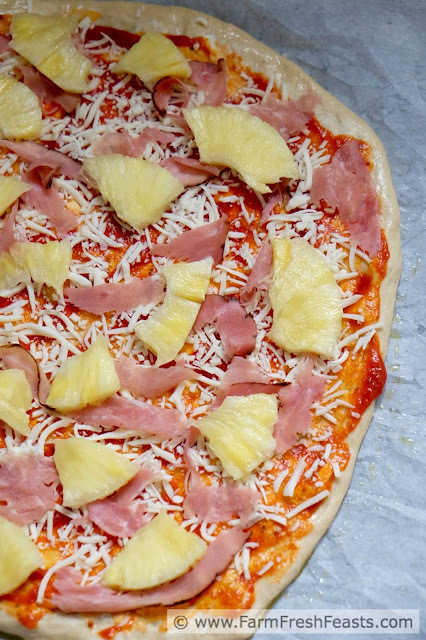 Thinly-sliced fresh pineapple and shaved ham atop a red sauce & mascarpone-spread honey wheat crust. It's the little touches that elevate a common pizza. For other pizza ideas, please see my Visual Pizza Recipe Index. It's got categories for dough, vegetarian pizzas, pizzas with meat and, where this one belongs, savory pizzas with fruit. I've also got a Friday Night Pizza Night! 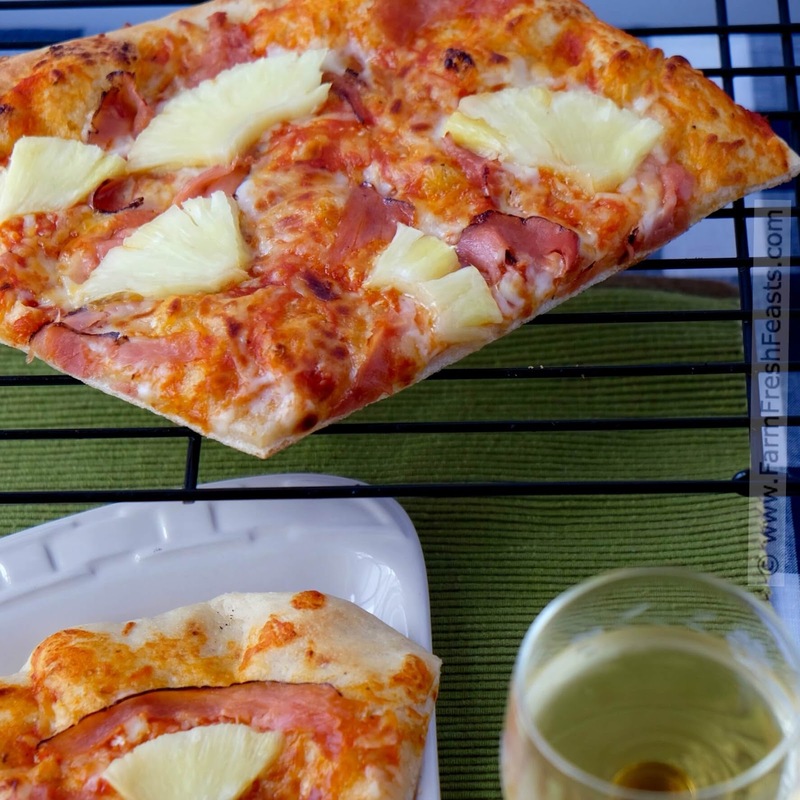 board on Pinterest if you crave ideas for pizza like I do. Want to know how to use this blog? Click here. 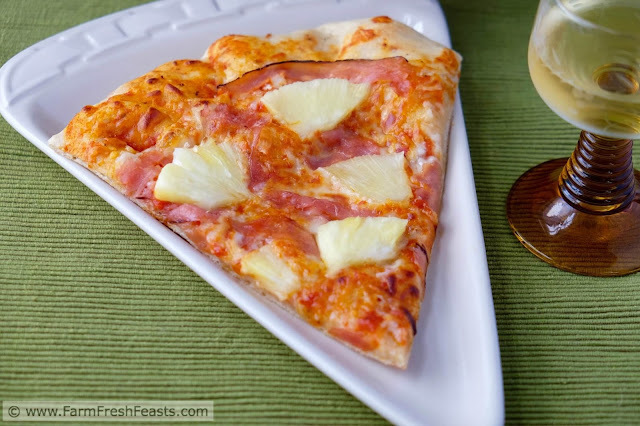 I'm sharing a pizza today that, for a change from my usual pizza recipes, is a topping combo found in standard pizza joints. No Beet Greens & Scrambled Egg Pizza here. No Shaved Kohlrabi Pizzas. 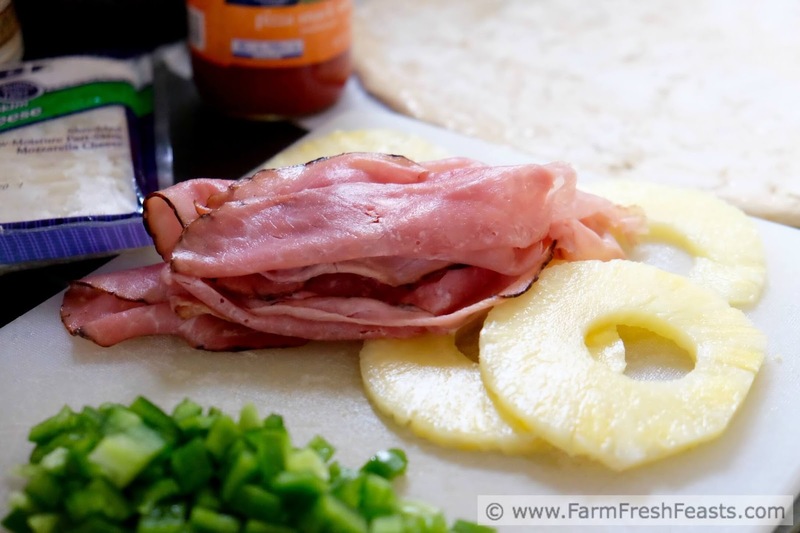 Nope, I'm keeping it simple today with ham & pineapple on red sauce. Except, as you'll see, it's the little things that matter. 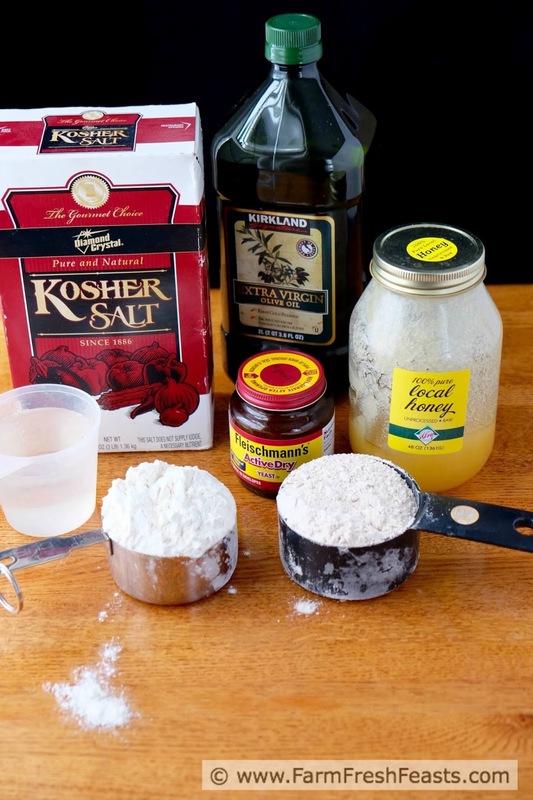 Little touches that make your homemade pizza just a bit better than delivery. 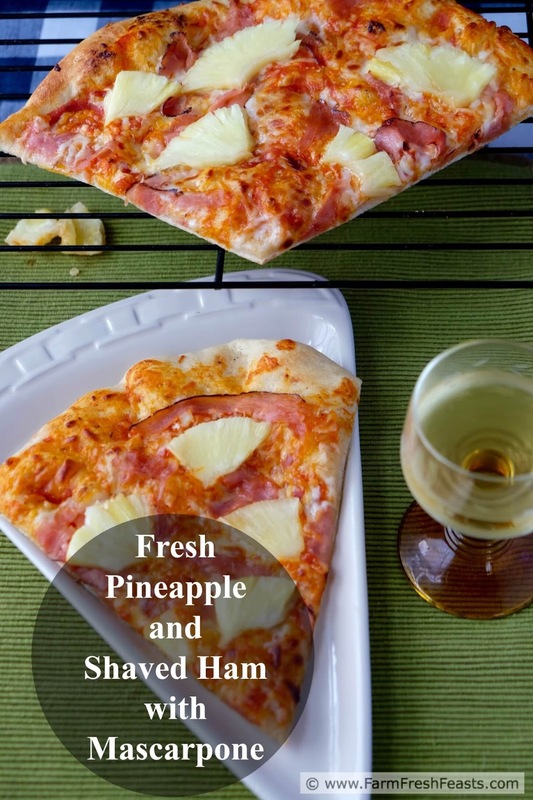 For this pizza my little changes are using fresh pineapple, using shaved ham, spreading a thin layer of mascarpone cheese on the crust, and using a honey wheat pizza dough. Get some mascarpone cheese. This is what, the third pizza using mascarpone that I've shared this year? THAT'S BECAUSE IT'S NOT JUST FOR TIRAMISU. I've never even made tiramisu, but I frequently have a tub of mascarpone in my cheese drawer. Use shaved ham. A very thin slice of ham gets crispier in the oven or on the grill, when compared to a standard slice of ham. That little touch adds texture and flavor to your pizza. Splurge on fresh pineapple when it's on sale. When living in Hawaii I learned to tell a ripe whole pineapple (look for 'eyes' all the same size), but unless I'm grilling spears I buy the pre-cored fresh tubs at the store. Do I ever buy canned pineapple? You bet--great in a dump cake and a smoothie. 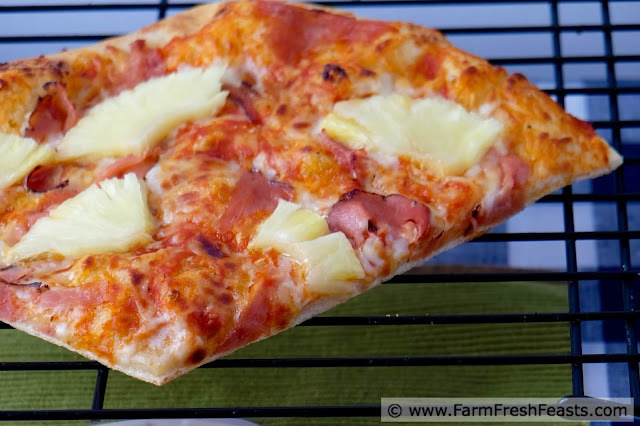 Fresh is better on a pizza because it is drier and the heat brings out the sweetness easier. 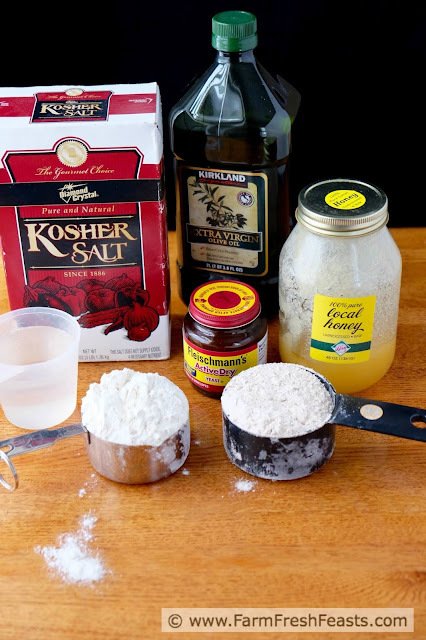 With just a few little changes you can make a terrific pizza at home, better than you could get at a pizza joint. Aren't you worth it? Preheat oven to 450 degrees Fahrenheit, and if you're making pizza at home you ought to invest $50 on a pizza stone that lives in your oven. It will pay you back in spades. On an oiled piece of parchment paper, stretch out pizza dough into the shape you mutually agree upon. 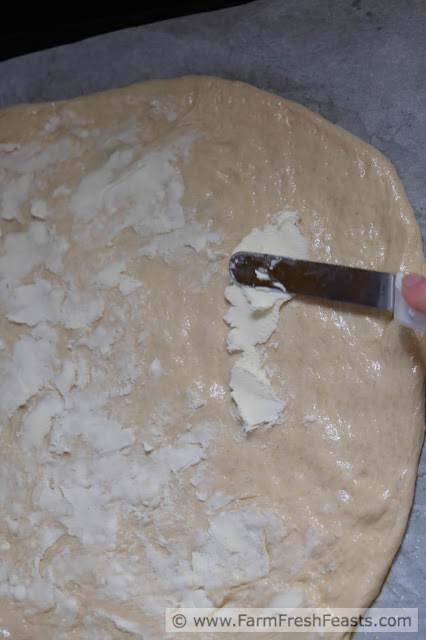 Brush dough lightly with olive oil, then spread a thin layer of mascarpone across the top. Spoon and spread red sauce on top of that. Scatter mozzarella cheese on top. Pleasingly place ham and pineapple on top of cheese. Slice the whole kittencaboodle (? that's not a word, keep the cats out of the oven regardless of their age) parchment paper and all into the preheated oven. Bake for 5 to 8 minutes, then shimmy the pizza crust off the parchment paper and bake directly on a pizza stone for another 3 to 5 minutes until cheese and ham and pineapple are starting to brown a tad. 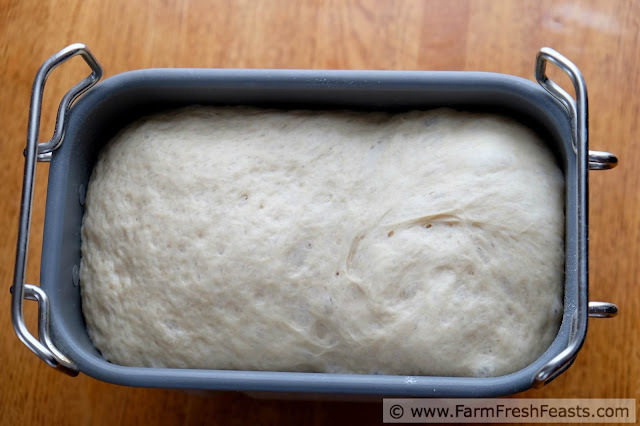 Remove from oven, cool, and slice. Wow, there's nothing about my Community Supported Agriculture (CSA) farm share in this post! 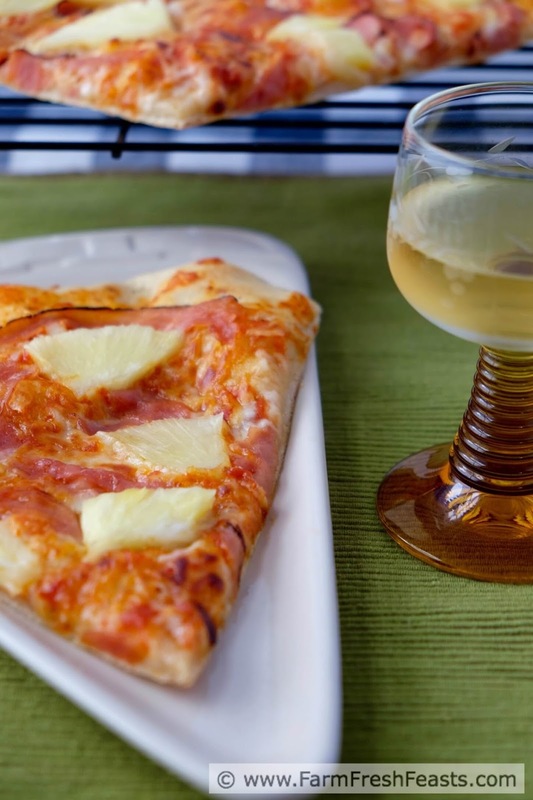 I love the idea of combining sweet pineapple and salty and savory cheese. It's a great pizza combo and truth be told, I can't remember the last time I had it. Hmm, I need to change that. Sweet fruit and salty/savory cheese. How prophetic of you to describe it this way. You do need to change that, and soon! Pizza with a Hawaiian flare is one of my absolute faves! You've just remind me of how long it's been since I've had such a slice. Your's looks delicious! Is it Friday yet? Special deal just for you--pizza on a day Other Than Friday!